Love is in the air! Whether your love is a fantasy you dream of, or your fantasy has become a reality - your dream come true - there are many personal checks celebrating how <i>fantastic</i> love is. 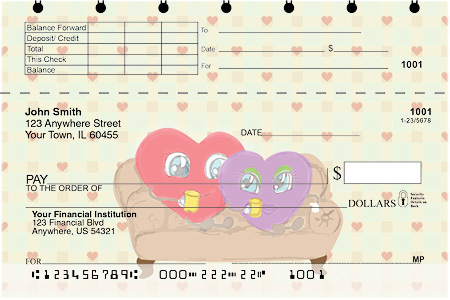 Show how much you <i>love</i> love with one of these check designs. Click your favorite for more info and to order. There's love in the air with these adorable heart shaped lovers!